We all know that making time for relaxation, reflection... vacation, is important. But, at KPMG, we believe it is equally important to maintain a work environment that encourages... fun! Seem like a contradiction? In a Big Four firm like KPMG, the work is demanding and the pace can seem relentless at time, so offering opportunities for fun through creative contests, light competitions and social events helps balance the load. What's the mark of a leader? Find out from Phil. Whether on the golf course or in the course of business, leadership has its own definition. Hear the stories behind the leading moments in his career at Phil.KPMG.com. It’s the coldest, driest, most unforgiving spot on the planet and sits at the "end of the world." It's Antarctica and it's where Sustainable IT Manager Darren McGann just recently returned. For Kansas City Audit Senior Associate Ryan Hudnall, taking a five-week sabbatical to work on a number of service projects in Kenya was more than a rewarding experience. This past summer, Boston Tax Manager Kyle Geiselman took the fitness-for-philanthropy model to a whole new level. Audit Associate, Sarah Guillen, challenged her father, accountant Ruben Guillen, that she could earn a higher score on the CPA exam than he had when he was her age. This summer, many KPMG people took time away from the office to travel and enjoy their favorite hobbies. But while most of us worked up a sweat on the beach or the golf course, two KPMG professionals engaged in some serious international competition. Here, find out how these world-class athletes spent their summer vacations. Atlanta Senior Associate Brian Thompson is taking a combined six-month sabbatical and leave of absence to hike all 2,176 miles of the Appalachian Trail in an effort to raise $100,000 for children's charities. Boston Audit Senior Associate Kat Decelles doesn't believe in halfway measures — unless you mean traveling halfway around the world to spend a year traveling to an African orphanage. Decelles took a year-long leave of absence from KPMG to help put a Tanzanian Orphanage on solid financial footing. Advisory Partner, Lori Greenawalt is a self-described "experiential traveler". About six years ago her adventures took an unexpected turn that changed her life — and the lives of scores of others. She and three friends traveled to a remote area of Peru with Medical Ministry International, where she helped to organize teams of medical professionals to help provide treatment to more than 200 patients per day. First-ever KPMG U.S. Ski Competition Connects KPMGers in Steamboat Springs. In late March, more than 30 KPMG people gathered in Steamboat Springs, Colorado, for a unique networking event: the first-ever KPMG U.S. Ski and Snowboard Competition. 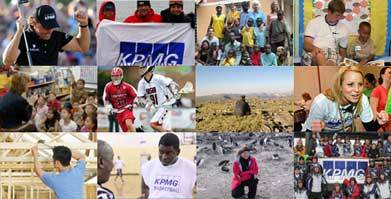 Want to know what life is like at KPMG? Hear from actual employees about their experiences with the company. KPMG provides employees with a generous time-off policy and wide range of leave plans. Time off includes vacation days and scheduled holidays to recharge yourself, as well as paid and unpaid leaves of absences such as parental leave, family medical leave, military and jury duty leaves and others to help employees meet their obligations to themselves, their family, and their community. KPMG understands that our people have personal priorities outside of the workplace, and believes that having a work environment that helps people manage the complexities of work and life is important to becoming an employer of choice and a great place to build a career. To help employees achieve financial stability and plan for the future, MyLife offers a number of services. These include help with retirement planning and ways to help employees achieve their retirement goals such as KPMG's pension and 401(k) plans. Who doesn't enjoy a great bargain? Thanks to special agreements KPMG has made with a number of companies and organizations, employees may take advantage of terrific buys and great values on a wide range of products and services. This section provides information about the range of health and wellness programs the firm makes available to encourage a healthy lifestyle - even in today's fast-paced environment. Corporate Responsibility is at the heart of our values and all around the world KPMG is committed to its communities — working to address poverty and make a positive difference in health and prosperity. This commitment also helps to make KPMG a more dynamic and successful organization. Through the KPMG Involve Program and KPMG Community Matters, our people continue to make a difference around the world through office and firm sponsored events. Learn how you can make a difference in literacy in your local community. See how KPMG is making a positive impact on the environment. Learn how KPMG compliments your dedication to our communities through the VTR Program.